Priest of God, you are called to be a continual Incarnation of the Mercy of God. How do you do this? Is it sufficient to simply preach about Mercy and strive to be merciful in your actions? No, the Mercy that a priest is to offer the Church and world is much greater. The foundational act of Mercy that you can offer is to freely choose to be Christ’s pierced and wounded Heart. It is only from His Heart that the blood and water of the sacramental life of the Church is poured forth. It is this wounded Heart that shines forth the rays of God’s purification and sanctification on the Church and world. You are called, in a unique way, to be a source of this outpouring by being pierced yourself. Here are five suggestions on how God wants to use your priesthood as an instrument of His Divine Mercy. These five actions bring about the purification and sanctification of the Church and world. They enable you to more fully share in the priestly ministry flowing from the wounded Heart of Christ. Freely choose to share in the suffering of the Heart of Christ. You uniquely do this as a priest by allowing yourself to receive, and then embrace, suffering. First, choose to accept, freely, every form of injustice that comes your way. Accept every ridicule issued forth by the world and by your own people. When criticized or condemned by another, don’t fight back or defend yourself. Don’t try to justify your actions or give into anger. Do not do this. Instead, accept every humiliation and suffering as from the Lord, for they are fully deserved as a result of your sins. This is the first step. Secondly, allow yourself to feel a pain that is much deeper than mere criticism or persecution. The unique priestly pain that more perfectly shares in Christ’s suffering is to feel the pain in the Heart of Christ that results from the rejection of the Gospel. Let your love for God’s people be so strong and all-consuming that you also experience what Jesus experienced. Let yourself experience the rejection of the Gospel. Sure, there are many who will run to you and will be open to the love in your heart, receiving the Gospel with joy. This will be a great consolation to you. But there are many who will not. There are many who will not open themselves to the Mercy of God shining forth from your own heart and priestly ministry. You will find, if you share in the love of the Heart of Christ, that you long for these souls with such a holy longing. This longing will produce the sweetest and deepest pain. Choose that unique priestly suffering and embrace it wholeheartedly. Once you choose to freely embrace the sufferings in the Heart of Christ, as experienced in your priestly ministry, you must then go one step further. Make sure that the free embrace is also done with great joy. Do not only accept these sufferings, rejoice in them. Rejoice in every piercing of the Heart of Christ in your priestly ministry, be they great or small. Rejoice and be grateful to our Lord that you feel the pain that His Heart felt. Your joyful embrace of these sufferings will be a powerful witness that will also produce strength for you, personally, to move forward with the sacrifice of your life as a priest. Freely choosing the sufferings in the Heart of Christ and rejoicing in those sufferings are not enough. The next step is to offer this freely chosen sacrifice to the Father in union with the Sacrifice of Christ on the Cross. Jesus is most perfectly a Priest when He offers His sufferings to the Father. The offering of His humiliations and the sufferings that came as a result of His rejected love are what enable Him to fulfill His mission as the perfect Priest. Join Him in that offering, especially as you offer the Holy Mass. Make this constant and intentional offering and you will find that you are living your priesthood on a whole new level. The Church, the world and our own soul are in desperate need of purification. Purification leads to sanctification and your free, joyful, priestly offering will purify. In this threefold act, you will be made holy, the Church will be made holy, and the world will be invited to receive the purification it needs. Priest of God, do not underestimate the role you play in the purification and sanctification of the world. This role, of being an instrument of The Divine Mercy, is more than the charism to preach and to celebrate the Sacraments, you must become the sacrifice with Christ, offering your life for the salvation of the world. Embrace your sacrificial role as a way of perpetuating the outpouring of The Divine Mercy of God, shining forth from the wounded Heart of our Lord. Once you have built a habit of daily embracing, rejoicing and offering all suffering to the Father, in union with the Sacrifice of Christ made present on the altar, you must seek to sanctify God’s people through every other aspect of your ministry. Your ministry is powerful and deeply needed in our world. Countless souls look to you to find our Lord. Do not be negligent in your ministry. Be zealous and conscientious in every way. Pray daily and allow the fruit of your prayer to direct the ministry of Christ made present through your priesthood. Teach, sanctify and shepherd the people of God, and do not grow weary of this privilege. The Lord chose you, He wants to use you in unimaginable ways. Dear suffering and persecuted Lord, my flesh is constantly tempted to reject the suffering I am offered. Dear Lord, instead of running from this pain, I desire to choose it freely. 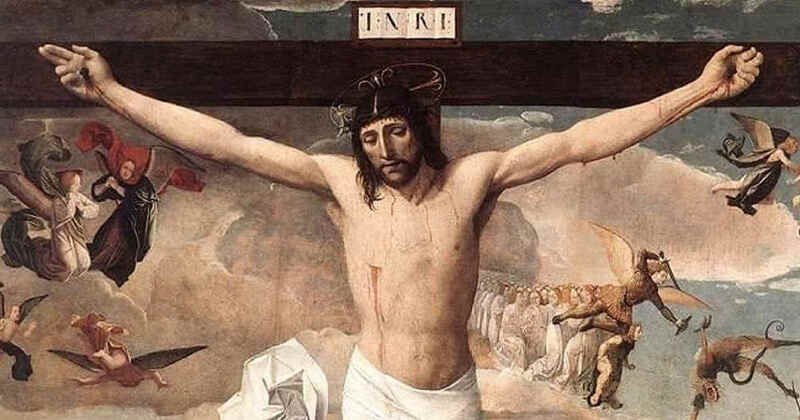 You Yourself said, “No one takes my life from me, I lay it down freely.” Lord, in imitation of You I choose, this day, every pain and every suffering I am given. I resolve that these swords which pierce my heart, over and over, shall not be imposed upon me. Rather, I thank You for the spear and for the soldier who thrusts that spear into my heart. I thank You for the pain that this produces. And I thank You for the honor and privilege it is to receive these constant piercings, especially those caused by the rejection of Your Gospel. Lord, I not only accept them, I choose them and I choose them freely. Dear Lord of Mercy, the pain I feel and now freely choose must produce joy. Therefore, Lord, I also choose to rejoice in this suffering. I rejoice in each and every thrust of the spear. I rejoice in each and every sharp and piercing pain. I am eternally grateful to You, dear Lord, for the honor of feeling such pain. I thank You for allowing me to share in Your humiliation and suffering. I thank You that I may be mocked and looked down upon, that I may be scorned and laughed at. And, dear Lord, on an even deeper level, I thank You that I can share in the suffering You felt as a result of Your burning love for Your people. It is this pain which is far greater than mere humiliation. The pain that comes from loving Your people and not being able to sanctify them as a priest, as a result of their rejection of Your Mercy, is the deepest pain of all. Thank You, Lord, that this rejection hurts so deeply as a result of my love for Your people. Dear Lord, our High Priest, You are the Priest and You are the Sacrifice. As Priest, You offer the Sacrifice of Your physical life, but You offer something even greater. You also offer the Sacrifice of all Your interior sufferings and longings. Lord, I offer this priestly sacrifice to Your Father with You. I offer it in union with Your own Sacrificial offering on the Cross. You experienced this pain, rejoiced in it as the fruit of Your love, and You then offered it to the Father. May I make this priestly offering with You. Dear Lord of Holiness, the fruit of Your Sacrifice is the purification and sanctification of Your Church. Purification comes first, then sanctification. It is for the fruit of purification that I pray the most. Please purify Your Church and the entire world through the offering of my priestly sacrifice. Purify, first, my own wretched soul. But, from there, I beg You to pour forth the rays of Your Mercy, flowing from Your wounded Heart, to touch and sanctify the world. Let the wound of Your Heart be opened wide so that the blood and water may, indeed, gush forth. May my heart be a continual incarnation of Your wounded Heart, dear Lord. May my heart, which is pierced and offered, become a font of Mercy for the Church and world in our day and age. Please purify priests, bishops, laity and the entire secular world through the new spring of blood and water which must gush forth. I thank You, dear Lord, for the honor and privilege of being an instrument of Your Divine Mercy in this world. Jesus, I trust in You.